The opening verses in this week’s Torah portion state the following, וַיֹּ֤אמֶר יְהוָה֙ אֶל־מֹשֶׁ֔ה בֹּ֖א אֶל־פַּרְעֹ֑ה כִּֽי־אֲנִ֞י הִכְבַּ֤דְתִּי אֶת־לִבּוֹ֙ וְאֶת־לֵ֣ב עֲבָדָ֔יו לְמַ֗עַן שִׁתִ֛י אֹתֹתַ֥י אֵ֖לֶּה בְּקִרְבּֽוֹ׃ 10:1 Then the LORD said to Moses, “Go to Pharaoh. For I have hardened his heart and the hearts of his courtiers, in order that I may display these My signs among them, וּלְמַ֡עַן תְּסַפֵּר֩ בְּאָזְנֵ֨י בִנְךָ֜ וּבֶן־בִּנְךָ֗ אֵ֣ת אֲשֶׁ֤ר הִתְעַלַּ֙לְתִּי֙ בְּמִצְרַ֔יִם וְאֶת־אֹתֹתַ֖י אֲשֶׁר־שַׂ֣מְתִּי בָ֑ם וִֽידַעְתֶּ֖ם כִּי־אֲנִ֥י יְהוָֽה׃ 10:2 and that you may recount in the hearing of your sons and of your sons’ sons how I made a mockery of the Egyptians and how I displayed My signs among them—in order that you may know that I am the LORD.” וַיָּבֹ֨א מֹשֶׁ֣ה וְאַהֲרֹן֮ אֶל־פַּרְעֹה֒ וַיֹּאמְר֣וּ אֵלָ֗יו כֹּֽה־אָמַ֤ר יְהוָה֙ אֱלֹהֵ֣י הָֽעִבְרִ֔ים עַד־מָתַ֣י מֵאַ֔נְתָּ לֵעָנֹ֖ת מִפָּנָ֑י שַׁלַּ֥ח עַמִּ֖י וְיַֽעַבְדֻֽנִי׃ 10:3 So Moses and Aaron went to Pharaoh and said to him, “Thus says the LORD, the God of the Hebrews, ‘How long will you refuse to humble yourself before Me? Let My people go that they may worship Me. Based upon these Scriptures, the Lord performed his miracles before all the world to see in order to show His power and authority over all creation, and as a way to show how much the Lord loves His people. This was achieved through hardening the hearts of Pharaoh and his servants. Chizkuni on Shemot / Exodus 10:1 notes that in the previous plagues, we do not see the Lord making this statement, בֹּ֖א אֶל־פַּרְעֹ֑ה כִּֽי־אֲנִ֞י הִכְבַּ֤דְתִּי אֶת־לִבּוֹ֙ וְאֶת־לֵ֣ב עֲבָדָ֔יו, “go to Pharaoh for I have hardened both his heart and that of his servants.” The reason the Lord acts in this way was because Pharaoh had confessed his sin but yet him and his servants refused to let the people go. Note in Shemot / Exodus 9:34 (But when Pharaoh saw that the rain and the hail and the thunder had ceased, he sinned again and hardened his heart, he and his servants.) we see Pharaoh’s servants supported him in his reaction to his confession of sin and his servants also supported him in hardening his heart again. The Lord was matching the punishment to the sin by hardening their hearts so the fullness of their sin may be complete. Does this parallel something in our lives today? Might this parallel following having sinned, we seek the Lord, confess the sin, but then hold on to that sin and its oppressive ways? What we see here in the context of the narrative is the lack of the proper function of Teshuvah. 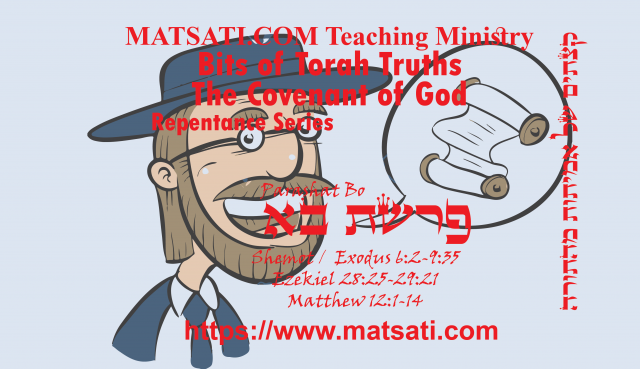 Within the context of his sin against God, Pharaoh confessed his sin verbally, saying what he believes, however there was no Teshuvah (repentance and turning from sin) on behalf of him or his servants. In the Talmud Bavli Sanhedrin 81, the rabbis established a rule that if someone was warned not to commit a sin and was warned a second time, there was no need to warn such a person a third time. The plague of locusts was the second in the cycle designed to teach Pharaoh “that there is no One like Me (God) in the whole universe,” and so there was no need to warn him of the plague of darkness which would follow the locusts if the people had not been released by that time. This teaches us about our lives, we will receive warning signs if we are going through the motions of seeking the Lord and confessing our sins and are not actively working to turn from them and never do them again. In the second book of the Torah, the LORD told Pharaoh that He was striking Egypt “so that you may know there is none like Me in all the earth,” and “in order to show you My power and in order to proclaim My name through all the earth.” What exactly does it mean to proclaim God’s name? To proclaim the name of God is not about pronouncing the YHVH. The Scriptures teach us that proclaiming the name of God means to reveal God’s character, who He is (in love and mercy), His power, and His glory. The revelation of God’s name thematically runs through the story of the ten plagues and the exodus from Egypt. The Lord God told Pharaoh through Moshe that he had raised him up and allowed him to remain “in order to show you My power and in order to proclaim My name through all the earth.” What these Scriptures teach us is revealed in the life of Yeshua the Messiah. Yeshua had the same objective, he said in John 17:4-6, “I have glorified you on earth … I have manifested Your name.” This was not how to pronounce the name (YHVH) but how to live for the Lord, to reveal His character in the way we live our lives. When we sin we seek God’s forgiveness in the Messiah Yeshua, and we actively work to turn from and not repeat the sin. It is in this way that we reveal God’s character and establish His reputation in this world. This is the ultimate point of the commandments. The Lord revealed His will for our lives, to bear His testimony, and to empower us to live as His people forever! This appears to be something that is overlooked today my many churches, the importance of the Torah in the lives of God’s people. Next articleTehillim / Psalms 133, ספר תהילים קלג, Part 1, Understanding the Meaning and Nature of Unity!